Theme parks and amusement parks have been places for fun family outings for generations. People bring their children from all around to ride roller coasters, eat carnival foods, and meet their favorite cartoon characters. Theme parks invest heavily in making bigger, better, faster and scarier rides than their competition. Unfortunately, sometimes this means there is a lack of focus on safety. People are injured at amusement parks in many ways. People commonly slip and fall on wet surfaces or garbage left on the ground. Rides break and malfunction causing injury or death. Some rides are just dangerous even if they are working right. Injuries are often caused by ride operators who are not paying attention and start a ride before everyone is securely fastened. Even other guests can injure you. 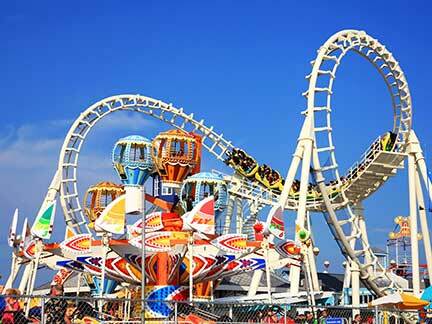 When you are hurt at a amusement park, an experienced theme park accident lawyer can help you. In layman's terms, a "slip and fall" or "trip and fall" accident means getting hurt on someone else's property, usually because of some negligence in maintaining or constructing the property or something on it. Legally, these types of injuries are part of a broad body of law known as Premises Liability. Other frequent types of Amusement Park premises liability cases involve conditions such as slippery surfaces, inadequate lighting, or a dangerous condition on land, such as an abandoned ride left open to children or the public without an adequate warning. These types of accidents occur because of the negligence of theme park owners and employees. Because theme park visitors are considered to have been invited onto the land for business purposes, theme park owners owe them a duty of care. Theme parks may also be liable for criminal acts of others such as muggings or assault that occur at an amusement park. When you or a family member are injured by an theme park employee's negligence, you may have a right to recover money damages. While money alone can never truly compensate you for the injuries you receive or especially for the loss of a loved one, the purpose of personal injury law is to try to bring you as close as possible to how you were before the theme park accident. Be that as it may, money is the only legal remedy available in these difficult situations and you should receive monetary damages for your loss. Personal Injury Lawyers and Wrongful Death Lawyers are experienced in assessing monetary awards and know what type of a settlement or award you might be able to expect from your claim. Defective Design - theme park rides could be negligently designed. For example, the safety restraints on a ride may not be designed well enough to keep riders safely in place for the duration of the ride. Manufacturing defect - The ride could be manufactured or assembled incorrectly. This would be the case if the ride was not welded together properly and collapsed. Failure to warn - theme park operators have to warn you about most dangers that they know of. Some rides are dangerous for people with a heart condition. If the owners know this, but fail to warn potential riders, the owners may be responsible in the case of a heart attack caused by the ride. Contact a Theme Park Injury Lawyer NOW to preserve your rights!